The World Conferences on Education which took place in Jomtien in 1990 and Dakar in 2000 have contributed significantly to the mobilisation of the attention of policy-makers, the international community and civil society organisations with regard to the need of ensuring that the right to education for all people – particularly language and cultural minorities – is upheld both in developing and developed countries. 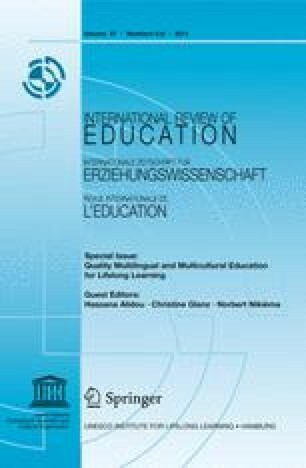 This special issue of the International Review of Education (IRE) focuses on quality multilingual education as a political and technical response to the educational requirements of learners. Multilingual and multicultural competencies are viewed as a communicative proficiency which is necessary for people to fully function in the 21st century. Group of Intellectuals for Intercultural Dialogue. (2008). A rewarding challenge. How the multiplicity of languages could strengthen Europe. Brussels: European Commission. Accessed December 16, 2011, from http://ec.europa.eu/languages/documents/report_en.pdf. Mohanty, A. (2008, August 27–28). Multilingual education for indigenous children: Escaping the vicious cycle of language disadvantage in India. Paper presented at UNU/UNESCO 2008 conference on globalization and languages: Building on our rich heritage, Tokyo. Accessed May 5, 2009, from http://www.unu.edu/globalization/.